Purveyors of the highest quality smoked fish, caviar, baked goods, and specialty foods, Russ & Daughters is New York City's premier appetizing shop. Since 1914, this landmark New York City institution has been owned and operated by four generations of the Russ family. Russ & Daughters has continued to provide the tastes and traditions of a true New York experience from the same spot on East Houston Street for more than a century. To place an order for pick-up in the shop or delivery in all 5 boroughs of New York City, please call us at 212-475-4880, ext. 1. Send a taste of New York anywhere in the country — as a gift or to yourself. All shipping orders are prepared at the Russ & Daughters counter and then shipped for you. Russ & Daughters' catering platters and packages bring the tastes and traditions of classic appetizing cuisine to your gathering. Our expert staff will hand-slice smoked fish and prepare beautiful platters of our salads, herrings, desserts, bagels, breads, baked goods, and more — so that you can serve your guests with ease. Platters can be picked-up at the shop, or we can deliver them by courier to all five boroughs of New York City. Platters can not be shipped. *24 hours advance notice required on all catering orders, except for shivas. Treat someone special to the gift of Russ & Daughters — send a taste of NYC! • Russ & Daughters Gift Cards purchased after 11/24/18 can be used at all Russ & Daughters locations. • Russ & Daughters Gift Cards can be sent digitally via e-mail or shipped. • There is a minimum value of $25 per gift card. For over 103 years, Russ & Daughters has been an integral part of the history of New York City, a touchstone in the lives of generations, and the torchbearer of Jewish food in America. In 1907, Joel Russ immigrated from the shtetl of Strzyzow, now part of modern day Poland. He got his start selling schmaltz herring out of a barrel to the throngs of Eastern European Jews on the Lower East Side. It took him seven years to work his way up from that first herring barrel to having a pushcart operation, a horse and wagon, and then, in 1914, a brick and mortar store. The original store was on Orchard Street. In 1920, he moved the store around the corner to 179 East Houston Street, where it has been ever since. Having no sons, Joel Russ required his three lovely daughters — Hattie, Ida, and Anne — to work in the store from the time they were teenagers. In 1935, he made his daughters full partners and changed the name to Russ & Daughters, a bold and controversial move. 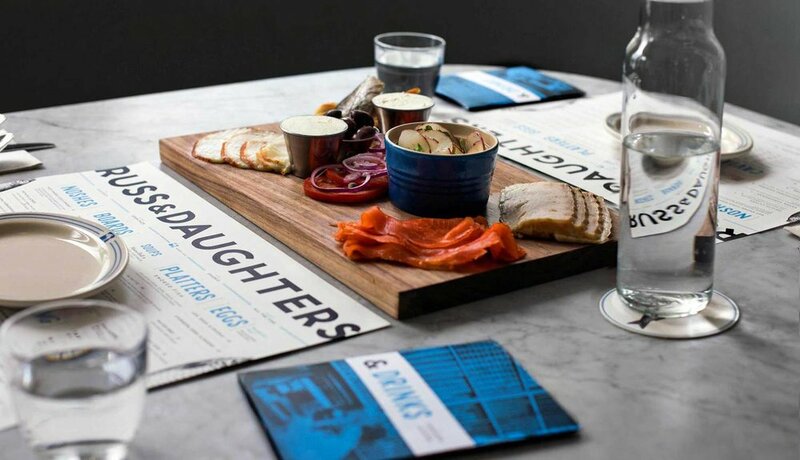 Russ & Daughters is the first business in the United States to have “& Daughters” in its name. The daughters married men who also joined the business. In 1979, when the daughters and their husbands were ready to retire, Mark Russ Federman, Anne’s son, decided to leave his legal career and become the third generation owner. For thirty years, together with his wife, Maria, they ran Russ & Daughters and made it into a New York destination, despite the Lower East Side’s reputation in those years as a rough neighborhood. Mark Russ Federman wrote an acclaimed memoir, “Russ & Daughters: the House that Herring Built,” which vividly recounts the history of Russ & Daughters and his time running it. When Joel Russ started peddling herring from a pushcart, could he have imagined a time when the fourth generation of the Russ family would walk, daily, into a landmark appetizing shop and restaurant hailed by the National Register of Historic Places, The New York Times, Gourmet, Bon Appetit, Martha Stewart, NPR, The New Yorker, New York Magazine, PBS, The Food Network, The Travel Channel, The New York Times Magazine, The Wall Street Journal, and Vogue — among many esteemed others — for its contribution to New York’s culinary and historical landscape? In 2013, the Russ family and Russ & Daughters became the subjects of the critically acclaimed documentary, “The Sturgeon Queens.” Produced and Directed by Julie Cohen, The Sturgeon Queens has been a favorite of critics and audiences at film festivals around the world, and it has aired on PBS stations. Russ & Daughters Cafe opened in 2014, on the 100th anniversary of Russ & Daughters, on Orchard Street, the very same street where Niki and Josh’s great grandfather had peddled herring. Russ & Daughters Cafe takes the appetizing classics for which Russ & Daughters is famous and presents them in a beautiful setting that evokes Russ & Daughters’ timeless appeal, history, and haimishness. At Russ & Daughters Cafe, expert smoked salmon slicers work their craft in front of guests; an open kitchen provides an over-the-counter connection like one feels in the store; a soda fountain bar beckons with homemade sodas, egg creams, shrubs, and superb cocktails; friendly staff proudly wear the iconic white Russ & Daughters lab coats; and 105 years of living history permeates throughout the entire space. The timeless appeal of the Russ & Daughters Cafe makes it a perfect spot any time of day: whether it’s a for a light nosh, brunch, lunch, cocktails, dinner, or a special occasion. You will be part of the mishpocha (family) — whether you have been a regular in the shop for 70 years or if you are a first time visitor. Russ & Daughters Cafe was awarded 2 stars in a glowing review by Pete Wells, in The New York Times, and named #2 on his list of "The 10 Best New Restaurants of 2014." In 2016, Russ & Daughters opened a new space combining a take-out appetizing counter and restaurant: Russ & Daughters at the Jewish Museum. For the first time, Russ & Daughters ventured away from the Lower East Side uptown to the Upper East Side. Russ & Daughters at the Jewish Museum is our only certified kosher location. In 2019, Russ & Daughters opened in the Brooklyn Navy Yard. Russ & Daughters in the Brooklyn Navy Yard is our Appetizing Factory. Featuring our bakery, which is on view for all to see, an appetizing shop where you can get your favorite classic bagels and lox or smoked fish by the pound, and our traditional baked goods right out of the oven, our expanded nationwide shipping hub, new kitchens, and an event space. “Appetizing” is a Jewish food tradition that is most typical among American Jews, and it is particularly local to New York and New Yorkers. The word “appetizer” is derived from the Latin “appete,” meaning "to desire, covet, or long for.” Used as a noun, “appetizing” is most easily understood as "the foods one eats with bagels.” Its primary components are a variety of smoked and cured salmon, homemade salads, and cream cheeses. Eastern European Jews started meals with cold appetizers, known in Yiddish as the “forshpayz.” In New York, the popularity of forshpayzn among Eastern European Jewish immigrants led to the creation of the institution known as the appetizing store. Appetizing also originated from Jewish dietary laws, which dictate that meat and dairy products cannot be eaten or sold together. As a result, two different types of stores sprang up in order to cater to the Jewish population. Stores selling cured and pickled meats became known as delicatessens, while shops that sold fish and dairy products became appetizing stores. In New York City, until the 1960’s, there were appetizing stores in every borough and in almost every neighborhood. On the Lower East Side alone there were, at one point, thirty appetizing shops. Though one of the last of its kind, Russ & Daughters is committed to preserving and promoting this important food culture. So, now that you know, please don’t call us a deli! To be literal, the dictionary definition of “appetizing” is, “appealing to the appetite especially in appearance or aroma; also, appealing to one's taste.” And that applies to Russ & Daughters as well. In 2014, 100 years after the founding of the business, on the very same street where Joel Russ first stood outside and sold his herrings out of a barrel, his great-grandchildren, Josh and Niki Russ, continued the family and business legacy and opened Russ & Daughters Cafe at 127 Orchard Street. In 2015, after 101 years solely on the Lower East Side, Russ & Daughters expanded to the Upper East Side to open Russ & Daughters at the Jewish Museum - a restaurant and take-out appetizing counter. In Brooklyn, at Russ & Daughters at the Brooklyn Navy Yard, we bake all of our own bagels, bialys, shissel rye bread, pumpernickel, challah, babka, black & white cookies, knishes, and other traditional favorites. Each of the Russ & Daughters recipes reflects four generations of dedication to authenticity, tradition, and history — a continuous thread that runs from the Russ family to your family. *Ask us about ordering a whole side of salmon. Russ & Daughters carries only “Malossol” caviar - the freshest, highest grade caviar with the least amount of salt.